Hello Ladies! 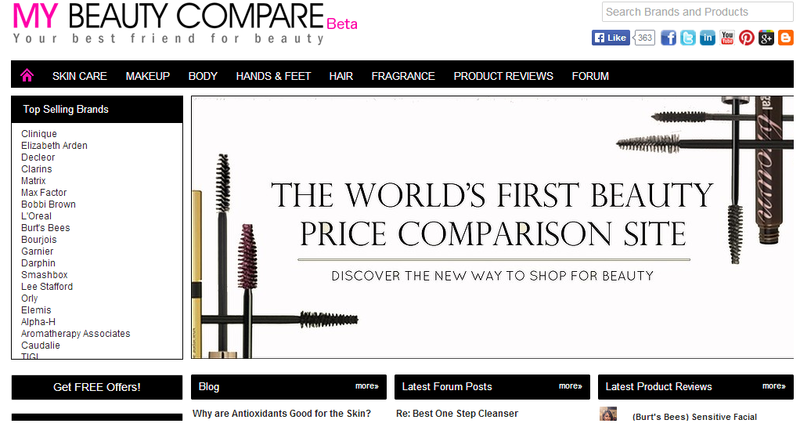 Before Christmas I was contacted by My Beauty Compare asking if I would like to let my readers know all about their website, which is a beauty comparison website. I thought now would be a good time to share as everyone is feeling the pinch a bit this month now that Christmas is behind us. My beauty compare works on the same principle that all of those car insurance, etc websites work - it allows you to let it know what your looking for beauty-wise then will direct you to where you can get the product cheapest. Firstly you need to register and fill out a quick questionnaire all about skin type, etc so that you never get recommended beauty product which wouldn't be to your tastes. It puts the product which are most suited to you at the top of the page so it's a lot easier to skim through and pick products that you want. Overall I think this is a great idea, I've been using this especially with skincare as it can be confusing sometimes to know which products are most suited to your skin type, as they often have strange names! * This is a sponsored post. I was gifted a few small beauty items, however all opinions and thoughts are my own. I think this is such a good idea!